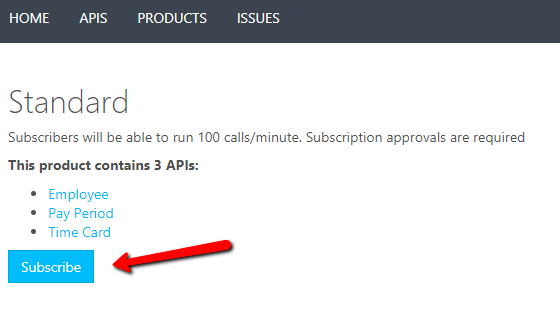 Follow these instructions to get access to our external API. Access to our API requires approval. Please use our live chat to request permission to use our API. The sign in will bring you back to Buddy Punch. Use your administrator Buddy Punch credentials to sign in. You will then be brought back to the Buddy Punch API home screen. Click on "Products." To get your subscription keys you can go to your profile in the upper right hand corner, or click on the Products --> Standard menu item to see and generate your keys. You will find all documentation in the portal that is applicable to each API you have access to.